I wanted to try out Linux for a while now, but alot of things have been stopping me. And since im about to uninstall my Windows XP and get Windows 7 I finally decided to get myself together and try out one of the Linux distros. P.S. Ive never seen Linux in my life... always worked with Windows..
Go for an easy install, and simple setup. My top choices. Although I run Fedora 11, I would not recommend it to a first time user. Those 3 distros I find to be the candidates for first time Linux Users. Of course, that's MY opinion. BTW, there are other threads here that deal with distro choice. One must look at all the forums to find them, or go down farther in the "Getting Started with Linux" threads. I will check out the forum again. Btw.. Im checking out Ubuntu at the moment, and i seem to like the way it looks ( for example Ubuntu Ultimate - ) am I correct to think that its the version you can download from ubuntu.com? I mean... will ubuntu 9.10 be similar? Also... what i might have forgot to mention... im looking for a GUI distro and yet im still interested in console distros ( like Slackware ) since i would like to get to know my system and be able to run deep level functions ( phrase stolen from Choosing a distro: Pros and Cons from real users :laugh: ), and im also looking for good compatability with windows applications, formats, games, ext. Thanks you looking over the other thread, unfortunately I am hoping more people can add their input, it will be more rebust in time. ubuntu ultimate is a third party mod on ubuntu and is not officially supported by the community so it may not be your best best, but all mods present in it can be applied to any ubuntu installation to make it just as friendly. Re: Compatibility: windows apps are differently than Linux programs, so installing a windows program would mean doing it through an emulator, and some emulators cannot run on 64-bit installations. The primary emulators for you to look at in regards to your windows apps are wine (http://www.winehq.org/), cedega (http://www.cedega.com/) and crossover games/office (http://www.codeweavers.com/products/cxgames/). The document compatibility is pretty good among office formats, most opensource productivity software can read and write to MS format (pre Msoffice 2007). One thing you may want to remembers is most software on Linux distros is free and some are more powerful than their expensive windows based counterparts, before you start thinking that you have to use an MS based app try some opensource alternatives. As for the cli vs gui comment, all distros run on a gui and cli, many cli apps only translate commands to the gui apps. No matter that distro you choose you will have the option to use the gui, but some like ubuntu have nearly removed the need for a normal user to use the gui. My recommendation for now is to install ubuntu 9.04 with the MS installer (named wubi) within an MS partition to try it out without devoting too much time, when you insert the disk when windows is running it will open a window that has an option "install in windows" this will be slower than partition based, but it is easier to remove. Play with that for a while, then when 9.10 is released you can install it in it's own partition. I am running 9.10 beta on another partition , the changes that I can see are it is faster, prettier and utilizes less resources than 9.04. Most notably the boot speed, it boots fast. 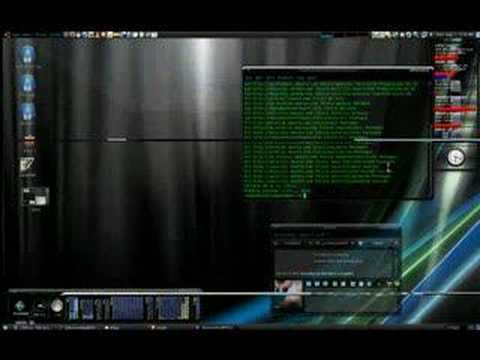 After you get familiar with the tools and functions in a more user friendly distro then it may be of interest for you to try Slackware, but it is not for new users because it requires alot of reading and learning, but it you are willing to allocate the time and effort to learning it is a very stable distro with a good community. Thank you for a detailed reply. So as far as I understand I can make a regular Ubuntu look like Ultimate Edition by downloading needed themes and software from openSource? The difference between them is that UE has everything pre-installed? Well as for a distro I guess im gonna stick with Ubuntu. It should be that the only difference between the two distros is the windows manager but that is incorrect, I have found some functional differences that cause me to recommend Ubuntu for the better tools and automation. As the for GUI choice, you don't necessarily have to uses another distro to get another GUI, you can install Ubuntu which has Gnome installed by default and when the system is installed you can then install KDE, xfce, lxde, enlightenment, blackbox, fluxbox, ratpoison or any other window manager you wish. You choose which window manager to use in the login screen under the sessions menu, but remember you must install the window manager before it will be present in the sessions menu. So right now I say to install Ubuntu, then when it is operational install KDE within it, then you will have them both running on the same machine and can play around until you find which best fits your needs. There are many different window managers available don't just settle on one of the big ones, play around with as many as you wish until you find the best tool for your needs. Ok, but since i dont know the difference between GNOME and KDE, could you tell me what makes UE desktop look the way it does (3D, window spinning, etc.)? Well KDE is most liek a windows interface and GNOME is more like a mac interface. In Ubuntu's Add/Remove Progam utility there are descriptions of every app, a search funtion, a breakdown by type and if I remember correctly it even has links to pictures. First off you want to go to Settings -> Administration -> Hardware Drivers and install any video or networking drivers that are available, your proprietary video driver is necessary for the desktop effects. For you effects you want "avant window manager" to have the pretty task bar buttons that were at the bottom of the screen, The other effects are part of compiz, there is a setting in appearance for effects that does s simple configuration, but you want download CCSM and compize settings manager to get more refined control, additionally there should be a package called compiz-effect-extras or something like that which will give you additional effect to choose from. I will post more specifics after I get home this evening. Thx alot for all the help. and for the system monitor on the right side of the screen you will want to search for gkrellm, and you can find various monitors for it by searching the name in the synaptic Package Manager. My screenshot shows Ubuntu 9.10 Beta running the listed apps, sorry the effects aren't visible because this is a static picture. , the Ubuntu screenshot is of the GNOME desktop. The image below is from my Slackware-13.0 64-bit installation with KDE4 running with some customized appearance settings added. KDE under Ubuntu wouldn't look much different. I see... thx for the help. Btw I read somewhere that some programs dont run on 64-bit OS... would it be better for me to install a regular 32-bit OS? Everything I run works perfectly on 64-bit, but others have different preferred apps. If you want to be conservative you can install the 32-bit version, the only real limitation you have runnning 32-bit is that it will not recongize more than 3GB of RAM.